Auto upholstery beginning to look a little worn? Is your resale value plummeting? In this economy, keeping your car longer makes great economic sense. But driving a car with stains and damage and with an interior in obvious need of repair is depressing. The damage not only makes you feel bad, it also lowers the resale value of your car. Call us now 1.877.334.9692 The damage will only get worse with neglect. Door Panel, Armrest and Console Repair Door Panels, armrests, and consoles are subject to damage from many sources: elbow wear on the armrests; weather caused dryness and cracking; seat belts that have not recoiled properly banging against the door; vinyl adhesion problems; damage from transported items like packages and furniture; other accidental damage. Let us make that damage vanish. 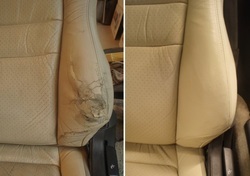 Car Seat Cleaning and Repair Re-upholstering buying new seats from the dealer is very expensive, but our auto upholstery repair and restoration is remarkably inexpensive. Perhaps you have leather or vinyl car seats that are cracking and fading. This needs to be attended to quickly before the rips, which come next, start. Do you have a hole on the driver's seat where you rub the leather or vinyl getting in and out of your car? Have indelible pens or markers stained your seats or have pets or packages scratched or marked them? Perhaps your car seats just need a deep, professional cleaning and conditioning to remove stains and embedded soiling. Steering Wheel Repair When the leather or vinyl on your steering wheel becomes stained, worn and unattractive, see the amazing difference our steering wheel restoration makes. For vehicle restoration and repairing let our experts make fading, stains, cuts and tears on your car seats door panels and more disappear.